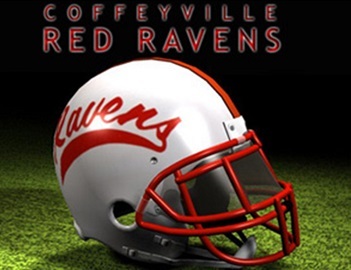 The very last 2018 football game for the Coffeyville Red Ravens regular season was on Saturday. They welcomed in a Prep. Academy out of Texas known as Resolution Prep. Resolution came into the chilly afternoon well over matched on paper and through the 2018 season as the entered with only one win, which came against a team at a similar level. In certain games giving up over 90 points, the Rec Ravens where precited to roll over their opponent but needed to stay focused and not let the upset occur. Which they did very well of, the very first play of the game was a 65-yard connection through the air from Kody Wilstead to Andre Thomas-Cobb and from there, the offense took off. Using many names that we hadn’t seen all trough the 2018 season though a partial sneak peak into a few players for next year. The defense of course played well as they have all year long scoring twice themselves, but for an offense that struggled at times this year they looked very good. Red Ravens get the win and finish the year winning 3 of their last 4 including against Montgomery County foe Independence. C.C.C. beats Resolution Prep. 62 to 0 and finish 5 and 6 on the year. With that record Coffeyville does not appear to be geared for postseason football, though coach Flores and the team wants to thank their fans for the support all through the year and can’t wait for next year!